Scientists in Wales tackling the impact flatulent cows and sheep have on global warming may have an answer - putting garlic in their food. Experts claim cows are responsible for about 3% of Britain's greenhouse gases. But initial results from the start of the three-year study show that feed containing garlic could cut the amount of gas produced by up to 50%. The Aberystwyth research team is testing if this taints milk or meat - and gives the animals bad breath. The study is being led by scientists at the University of Wales, Aberystwyth, alongside colleagues at Bangor and Reading universities. In Aberystwyth, researchers are measuring the amount of methane and nitrogen produced by sheep by housing them in a plastic portable tent. Project leader Professor Jamie Newbold said new types of feed from plant extracts, and grass with a higher sugar content, were being developed to help solve the problem. "Initial results show that extracts of garlic compound could reduce the amount of methane produced by the animals by 50%," he said. "Garlic directly attacks the organisms in the gut that produce methane." He added that tests were also being carried out to see if the garlic gave the animals bad breath and more specifically if it could taint milk or meat. But he joked that this might be "good for the French market". Experts consider cows the biggest single source of methane - a gas 23 times more potent than carbon dioxide when it comes to global warming. 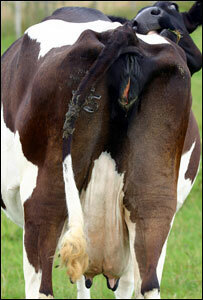 The average dairy cow is capable of producing up to 500 litres of the gas every day, mostly through belching. Reduce that, claim the experts, and farming could not only be made greener and more efficient, but it could also help Britain achieve its commitments under the Kyoto agreement. 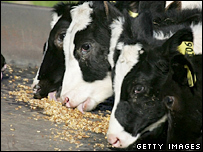 A spokeswoman for the Department for Food, the Environment and Rural Affairs (Defra) said recent research suggested that "substantial methane reductions" could be achieved by changes to animals' feed. Prof Newbold explained that cattle and sheep were responsible for about 30% of methane emissions in the UK. In Wales, they produced nearly double that - which amounts to 5% of Wales's greenhouse gases. He said the work commissioned by Defra, worth some £750,000, had unified a number of schemes looking into flatulent animals. The project also involves Aberystwyth's Institute of Grassland and Environmental Research and environmental specialists Adas.